“Magic” is a word that is used to describe a wide array of cultural practices, from sleight of hand (legedermain) to summoning demons, from healing with herbs to divination from the entrails of animals, from calling down pagan deities to prayers to a monotheistic god for blessings. Many Neo-Pagans practice some form of magic or “magick” (as it is sometimes spelled to distinguish it from secular magic). 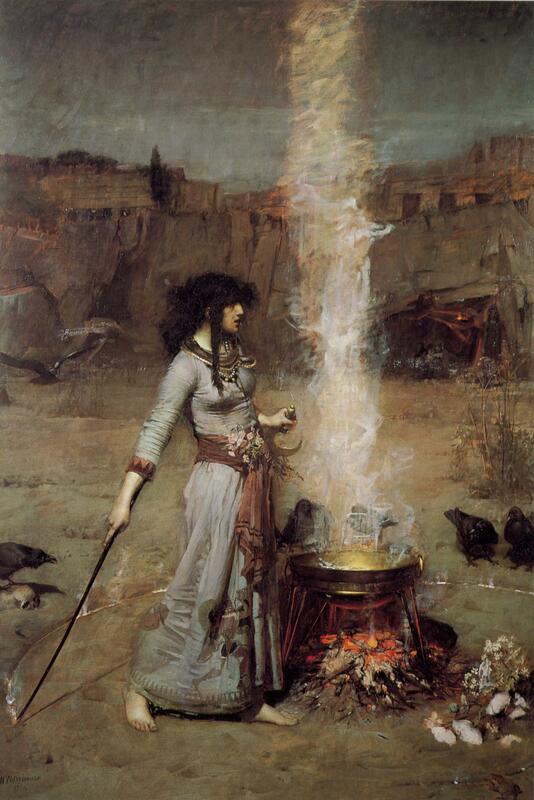 The term “magic” is used in different ways by Pagan authors. “Magic” is often used to describe practices which seek to project the magician’s will on the natural world by supernatural or occult means. “Magic” is also used to describe a kind of psychotherapy, which is indistinguishable from other religious symbolism and ritual. Finally, “magic” is used to describe a “re-enchantment” of the world, meaning an expanded consciousness of the radically interconnected world of which we are a part. Aleister Crowley famously defined magic as “the science and art of causing change to occur in conformity with the will.” In Persuasions of the Witch’s Craft, Tanya Luhrmann describes how some Pagans believe in a kind of spiritual “energy” which permeates the world, but is not detectable by current scientific methods. This energy supposedly can be manipulated by focusing one’s mind or will to cause change in the physical world without corresponding physical action. Some Pagans will invoke quantum physics or chaos theory to explain how magic works. To philosophical naturalists, this is just wishful thinking. Setting aside the question of its efficacy, other Pagans are suspicious of this kind of instrumental magic, which is seen as essentially just another attempt by human beings to exert their dominion over nature. It is a form of “technology” which views the world as an object and all the things in the world as resources for use by human beings. Barbara Walker explains that the real aim of instrumental magic is the same as any fantasy: “to retreat from a troublesome reality into a world of pure symbol. However difficult, uncontrollable or indifferent the external universe may seem, symbolism is manipulable and so provides at least the illusion of comfort.” This kind of magic is not countercultural at all; it is another expression of the modern estrangement to which Neo-Paganism stands as a challenge. Trudy Frisk has written about the conflict between magic and other Neo-Pagan values in an article entitled, “Paganism, Magic, and the Control Of Nature”. According to Frisk, the instrumental view of magic “perpetuates the utilitarian view of nature. Expecting natural objects to fulfill human desires leads to disregard for maintaining nature in all its complexity.” This causes Frisk to wonder: “How does that paganism differ from monotheistic religions trumpeting their dominion over nature? … Shouldn’t we try to discover the pattern that Gaia is weaving before presuming to interfere? … Perhaps we should attune ourselves to the Earth before attempting to intervene.” This attunement is precisely the purpose of many Neo-Pagan rituals: attunement to the cycles of nature, attunement to our deeper selves, and attunement with one another. Many Neo-Pagans draw on Jungian psychology to explain the function of magic and ritual. In this perspective, magic is indistinguishable from other religious ritual, which seeks to speak to the unconscious in a language that it understands, not for the purpose of controlling the unconscious, but for the purpose of integrating it into our conscious lives. According to Jung, psychological change cannot be achieved through will or intention alone. People require symbols and rituals which speak to the unconscious in a way that rational language cannot. To the occultist, the careful and precise application of magical formulae can be used to control natural and supernatural forces. The occultist imagines himself to be something like a natural scientist, but one who understands (super-)natural laws which are unknown or unrecognized by the scientist. The Neo-Pagan, on the other hand, knows that, in the realm of the unconscious, control is an illusion. The forces of the unconscious may be invoked, aroused, courted, persuaded, or seduced … but never controlled. As W. H. Auden writes, “Healing is not a science, but the intuitive art of wooing nature.” Neo-Pagan ritual, therefore, is not like a scientific formulae, but rather like poem or a dance. If a Jungian Neo-Pagan uses a ritual circle, for example, it is not to magically contain the forces of the unconscious, but to create a psychological space into which those forces can be invited. The unconscious may manifest, or it may not, or it may happen after the ritual is completed and when it is least expected. Frisk suggests that magic may also be understood as an expression of wonder. Many Neo-Pagan authors use “magic” synonymously with “re-enchantment”. This kind of magic shifts our way of seeing the world, drawing our attention to the the subtle connections between ourselves and the natural world, not for the purpose of controlling that world, but for the purpose of appreciating it, celebrating it, and attuning ourselves to it. Magic, in this sense, is a countercultural response to a reductionist and positivistic science, which views nature as a mechanism, and a capitalism, which reduces nature to commodity and resource. Neo-Pagans, in contrast, consider nature to be the embodiment of divinity and the localization of the sacred.